My name is Carolyn Matthews. I am originally from Peterborough New Hampshire and am now 1,000+ miles away from home for the academic year. A lot of people ask me why I chose Wisconsin, and why I chose Stevens Point. The reason is simple: Stevens Point campus has a nationally accredited Interior Architecture program with several active, design oriented student organizations. It also has an accessible and outstanding music department. 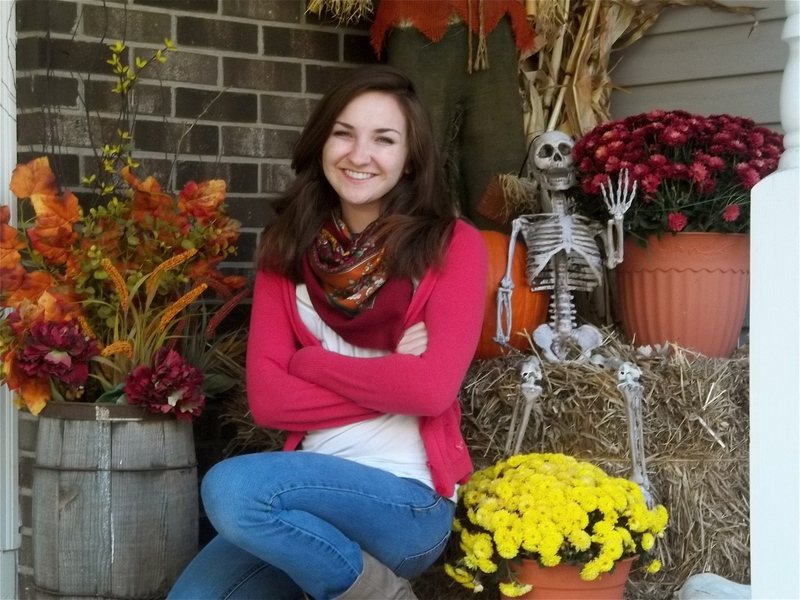 I am currently a junior working on a BFA in Interior Architecture; I am also currently working on a minor in music, as well as a minor in Psychology. So far, I love it. In the past two years at Stevens Point I have excelled in the design program, received high and highest honors from the university, captained an intramural soccer team, been active in orchestra and small ensemble, and more. The reality of interior design is one of extremely hard work, knowledge, and commitment. We learn about space planning, codes, building structure, and computer programming to name a few. A true and successful designer is one that is innovative, meticulous, and passionate about all aspects of design. It is true that we choose paint, fabric and accessory for the interiors we create, but the larger part of what we do is all process. We will document that process from start to finish; giving prospective students a glimpse into what is truly means to be a design student here at UWSP! This blog is going to follow me and the small group of outstanding students that I am working with this semester. They will also be occasionally writing about the project and the steps that we go through. They are Kate Wilfahrt, Kayla Bodart, and Joslyn Fedie. The 311 Group! 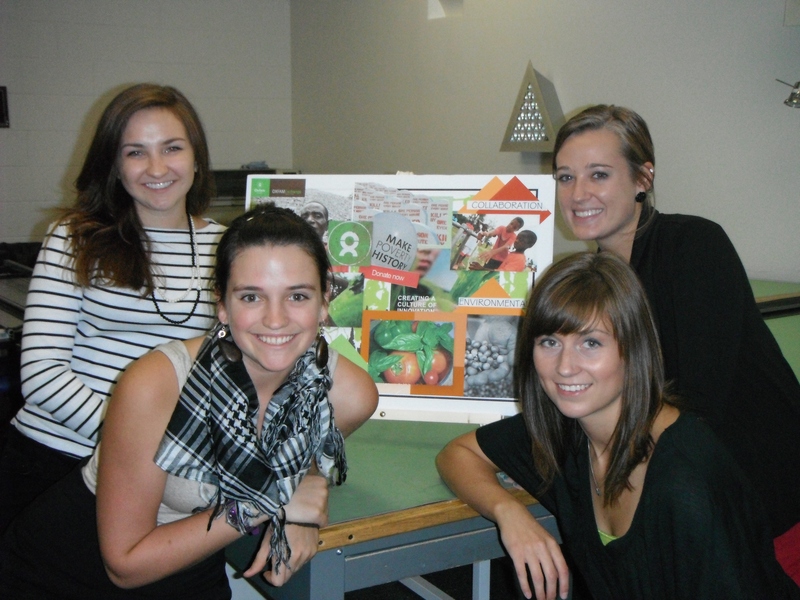 Left to right: Kate, Carolyn, Joslyn & Kayla, posing with our mood board after presenting our concept. Thank you for your interest! And enjoy! Our studio this year is called IA 311 and is focused on office design. This semester our class will be working in small groups to define, explore, create, and present a midsize commercial design project. As part of this project we have the opportunity to choose and define who our client will be! At the beginning of studio projects we, as a class, are usually given a predefined client profile that outlines where they are from, where the project will be, the client’s background (such as job, interests, family size, etc), what they are looking for in the design, and more. It is from this profile and the existing floor plan that we begin to make design decisions. That is our jumping off point. In addition to this client profile we also researched and analyzed a few articles about office design to use as case studies. It’s always beneficial to see what other designers have come up with as solutions to similar problems. Because we have the power to choose our own client this time we have to write our own client profile. The four of us have decided to work with an international humanitarian non-profit called Oxfam. In this hypothetical design situation Oxfam America (a branch of the international organization) has decided to move their headquarters into a new building in time for their 50th anniversary. We chose Oxfam because of its energy, mission, and inspiring values. Although we were given the opportunity to choose this client, we were not allowed to choose our floor plan. We also have to work with the Steelcase “Kick” office system, which is a progressive and adaptable system of desks, tables, collaboration centers and partitions. The four of us sat down and wrote out the client profile over the weekend. Doing this involved a lot of research online to determine company structure and what type of workstations they would require. The end product was a pretty extensive PDF file that all four of us helped write and Kate formatted. Now that we have our client, space requirements, number of employees, adjacency suggestions, etc. we can start the ideation and conceptualizing stage of the process. We will base a lot of decisions on this client profile, so it’s good to have it done! Coming up next for this project will be defining specific systems, drawing bubble diagrams, creating an adjacency matrix, writing a concept statement, and creating a mood/concept board! Today is our final work day before we have to submit phase one of our project! Right now we’re completely on schedule, with almost everything formatted. It’s always a good feeling when you don’t have to rush to meet a deadline. The past couple of weeks we have been very busy here in our studio. Being almost finished with phase one means that we are pretty much ready to move on to schematic floor plans, and final AutoCAD drawings. But, now I’m getting ahead of myself. 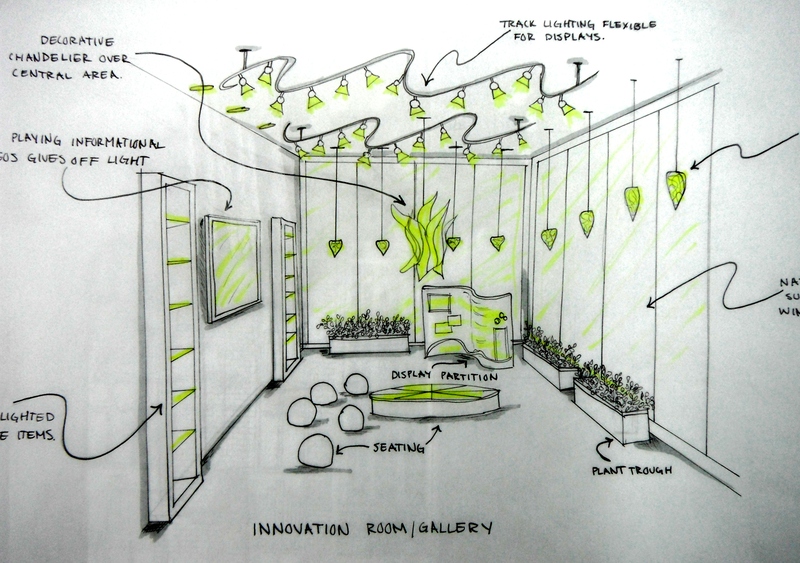 To reach the point of space planning a lot of ideation and conceptualization has had to happen. This semester we started by creating design guidelines. What I worked on was Adjacencies. 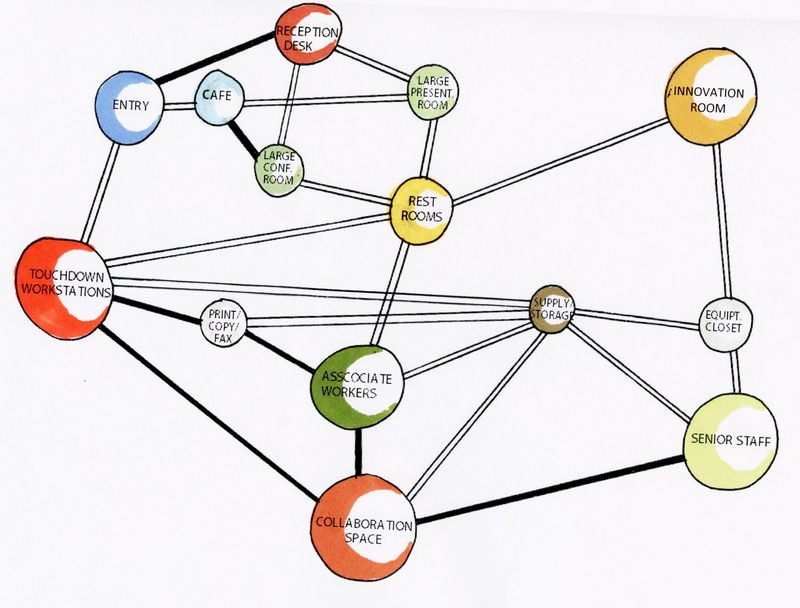 For this section of phase one I created a space adjacency matrix. The purpose of this matrix is to organize and link different activity areas together. First I listed, broadly, the different spaces needed in our office. They are: Entry, Reception Desk, Innovation Room, Large Conference Room, Printer/Copy/Fax Area, Large Presentation Room, Café, Supply & General Storage, Equipment Closet, President, Chief Operating Officer, VP for Development and Communications, VP of Strategy, VP for Programs, Chief Financial Officer, VP of Policy and Advocacy, Collaboration Area, Touchdown Workspace, Associate Workers, Windows, Restrooms. 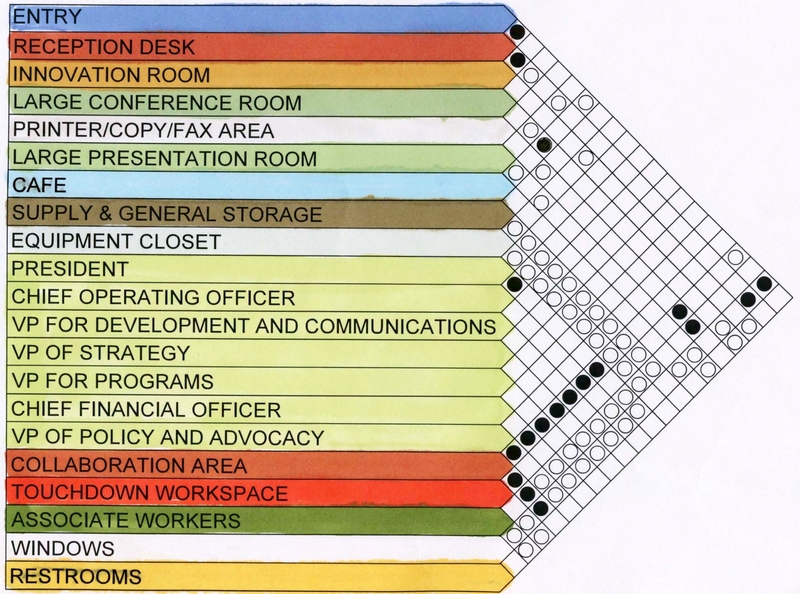 So, these are the areas that we need inside the office environment. We do not simply throw a bunch of desks into a room and match the color of upholstery and carpet. As designers it is extremely important that the floor plan we finally create is one that is effective and is one that will meet our client’s needs. The restrooms need to be close to the presentation and conference rooms (for ease of access), the senior level staff need to be close to their associates and collaboration areas. The associates need to be close to a copier and fax. Etc. Etc. It would be impossible to keep track of all of these proximity requirements without help. This is where the matrix comes into play. The black dot represents primary adjacency and the white dot represents secondary adjacency. When we start putting these areas into the actual floor plan this is a huge help! Using this matrix I created two different bubble diagrams. 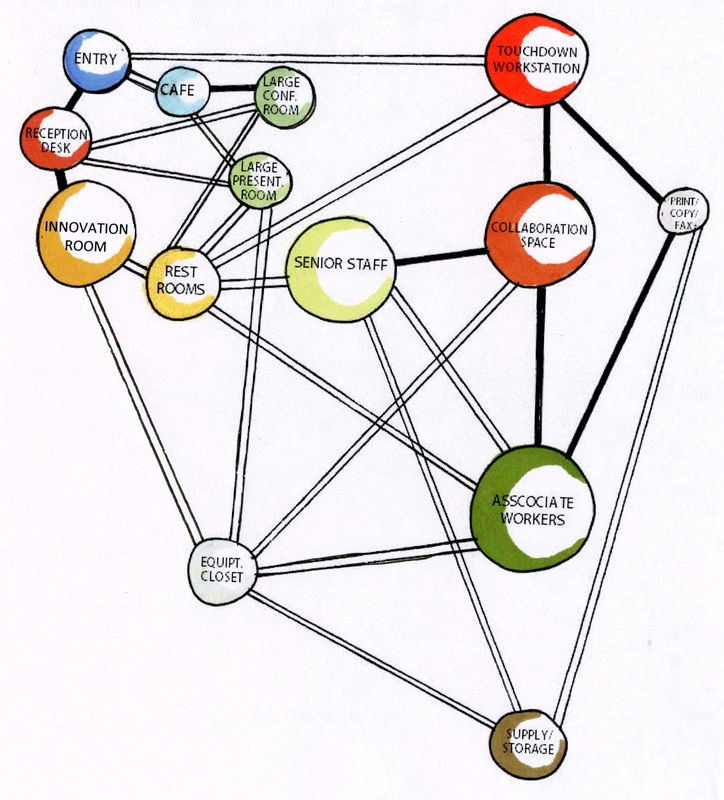 These diagrams use the same data as the matrix, and the same visual connections (black and white lines), to represent our space in an abstract way. In these diagrams no other line can cross a primary adjacency, but secondary adjacencies can cross each other as much as they want. I drew the matrix in AutoCAD, exported it as a PDF file, printed that, rendered it with prismacolor/chartpak markers, and scanned it back in as a JPEG. For the bubble diagrams I started by drawing it freehand with pencil until I found an arrangement that worked, then I did a final in pen, scanned that, put it into PPT, added text, printed, rendered, and finally scanned it back into the computer. Check out Joslyn’s post to read about how we came up with our concept and to see our final mood board! I come from the little old agricultural town of Durand, Wisconsin; which is only a little over two hours northwest of Stevens Point. To be completely honest, I was not planning on UW Stevens Point until my dad came across it one night while we were looking for Interior Design programs in Wisconsin; I laughed and said, “Steven’s what?” thinking he only mentioned it because the city had his name in it. But I then realized he was being completely serious, so I did my research and found out that UW Stevens Point would be an excellent college for me; the city was much larger than Durand but just small enough for me to easily transition from the small-town-country-girl lifestyle I’ve known all my life to a considerably larger city that had similar focuses including agriculture, recreation, and environment. Fortunately, these key aspects of the city were not the only perks of attending UW Stevens Point but also the nationally accredited Interior Architecture program and innovative, inspiration-driven courses. Now in my first semester of my junior year, I am working on a BFA in the Interior Architecture Program as well as a just recently declared a Business Administration minor. After the two fast-moving years that seemed to fly by here at Point, I have realized just how much I love it here. I’ve had several opportunities to get involved and get inspired in the Interior Design real world. I am currently the Co-President Elect and Social Programs Chair of the UW Stevens Point Student Chapter of ASID and I am continuing to create my mark and refine my skills here at UW Stevens Point. I agree with Carolyn and all of the other Interior Designers when they say that we are often misunderstood and believed to just be decorators who have no care in the world. Well I’d like to say, “News Flash! Our jobs are way more in-depth, detail-orientated, and technical than people often see.” The design shows on HGTV are not even the beginning to our design process; these shows only show the end process and results, a.k.a. the fun part. There is much more technical and hard, committed design work that goes on before the fun part; we not only have to consider the customers’ wants and needs but we legally have to abide by codes, fire-safety ratings, restrictions, need I say more?.. So going off of that, I would like to introduce the second and extremely important step of our design process called the “Design Concepts.” After creating a client profile and addressing the client’s needs, we looked over the client’s profile and company to find the repeating ideas. Once we can narrow down these ideas into a few main words, we expand off these words to create definitions, structural setups, and abstract sketches of possible design layouts along with an underlying conceptual foundation. This step with setup the overall mood of the space and will be the first part presented to the client to confirm that the design is starting off on the right foot. Our five conceptual words are Community, Leaders, Global, Dynamic, and Charitable. These five words not only describe the major aspects of the company but also create the overall feel and plan of the workspace. To give a quick overview of the design concept progress, we plan to develop a fairly open-space plan with collaboration circles, an inspirational space, and an educational center for employees as well as the out-of-house community as well as touchdown spaces for traveling and/or international personnel. 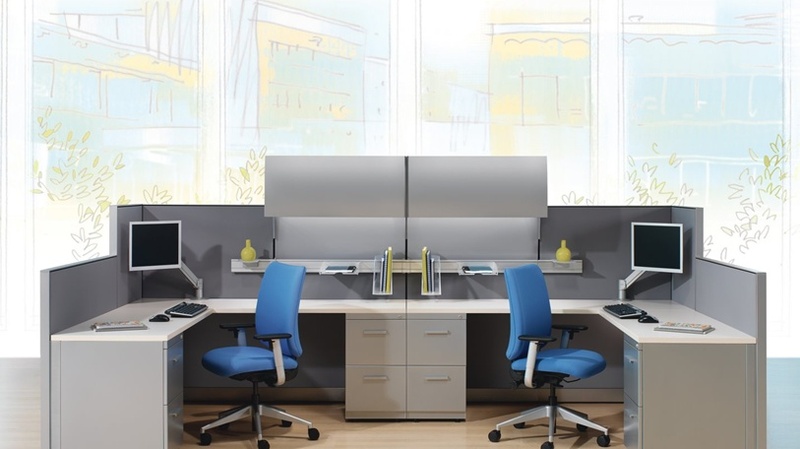 Our design gives priority of collaboration and innovation over sectioned off cubicles. After our research and conceptual work, we worked to prepare and present a mood board to the client that in a real-life situation would make or break the original design direction. Our mood board consisted of our central concepts, the company’s strongest color palette, and the mood off of these aspects. With that we created a mood that would illustrate energy, motivation, collaboration, and environment. Our presentation covered the client profile, our concepts, reflection of concepts, and how these concepts are to be applied. We have successful got our design direction off to the right start. Here is our Phase One Concept Statement. Enjoy and thank you for your interest! We have now finished and submitted phase one of the Oxfam Headquarters project. As part of the space planning and conceptualizing we had to choose and define what approximately 400 square feet of our office will be used for, and this would be a space specific to our organization. At first our idea was to have a presentation amphitheater where lectures and educational events could take place. Perhaps a week before phase one was due we decided that this was too similar to the presentation room that we are already are required to include! After collaborating, brainstorming, and of course scrapping some non-ideal solutions, we came up with what we’re calling the “Innovation Room”. This space would be used for exhibits, hands on education, and demonstrations. The idea is to have a dynamic and flexible area in which different displays can be set up for the public to experience. This happens pretty often while defining a project, ideas or plans are invented, and then changed. The ability to remain adaptable in these kinds of situations is an extremely important skill to have. And being flexible when plans change will prevent a lot of stress! This semester everyone in our studio is also in IA 318: Lighting Design. Part of that class is the conceptualization and drafting of a lighting plan, reflected ceiling plan, and electrical plan. This year 311 and 318 are joining forces and instead of working on a completely different project for our lighting class we get to use this office design project! So far we have put together another client profile outlining needs from a lighting perspective, identified the mood wanted for different areas, identified potential problems within the space, and drawn several lighting design concepts. These concepts, I thought, were the most fun part of this initial process! Basically it is a rough interpretation of how light would interact with the space. Here we have our favorite floor plan concept, and a perspective. The yellow represents focused illumination that would accent walls, or light tasks. And then varying shades of grey just show what we would want lighter or darker within the office, based on light psychology and the client’s needs. Now we are all busy working on different plans…losing sleep, and dealing with CAD errors. Life is good. My name is Kate Wilfahrt. That’s Wil-FERT not Wil-FART, don’t be deceived by spelling, I’ve gotten a lot of laughs out of its German origin. I grew up not too far from Stevens Point in Oshkosh, W.I. about an hour east from Stevens Point. I am a double major pursuing my BFA in Interior Architecture and Design and a BA in Graphic Design. I must say my parents are the major source of my inspiration and passion for design. My dad is a teacher and part time musician and my mom a graphic designer and artist. Naturally these artistic passions of theirs have rubbed off on me and I have enjoyed the arts since I was little. I have always been very interested in architecture, and after I gave up that childhood dream of becoming a ballerina princess I knew I wanted to focus on architecture and design. However when trying to select a school I was rather undecided about exactly what major I wanted to pursue. I loved architecture but also wanted to find a way to utilize even more of my creative artistic side. That is when I began to look into Interior Architecture and design programs around the state. I was at first a little reluctant to come to Stevens Point because is seemed small and secluded and I thought the bustle of city life would be more exciting. However, I took a leap of faith with the city and the program and I absolutely love it. The Interior Architecture program here is amazing! I found interior architecture to be the perfect combination of technical skill, architectural design and artistic creativity. These past weeks we have begun work on phase 2 of our design project. In the first part of phase 2 we focused on brainstorming basic conceptual ideas for our spatial layout. We created 4-5 “parti” diagrams, which represent the most simplified versions of our major areas in the space and our travel paths. Then came block diagrams in which we have completely given each space a specific position on the floor plan and name. In this stage we also calculate the square footage of the different areas. We add annotations or notes to our block floor plans that provide information about the relationships between spaces and circulation paths. After we completed these planning diagrams we chose our best block diagram to begin creating our preliminary floor plan. 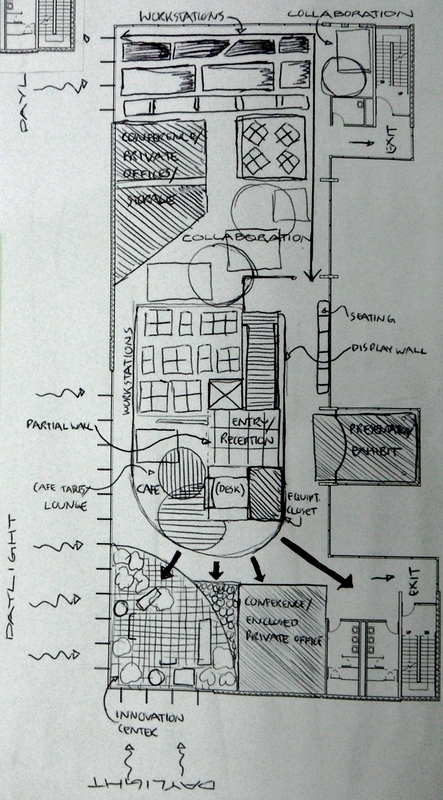 Our preliminary plan is a rough draft of our final space. We began building walls, and built in features such as cabinets and a reception desk. 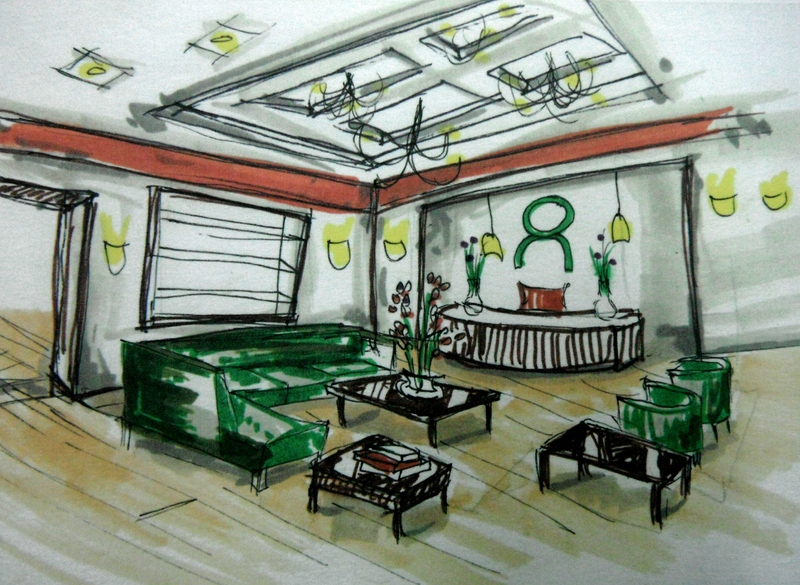 We also added colored perspective sketches of different areas in the space to really bring some vision to our project. 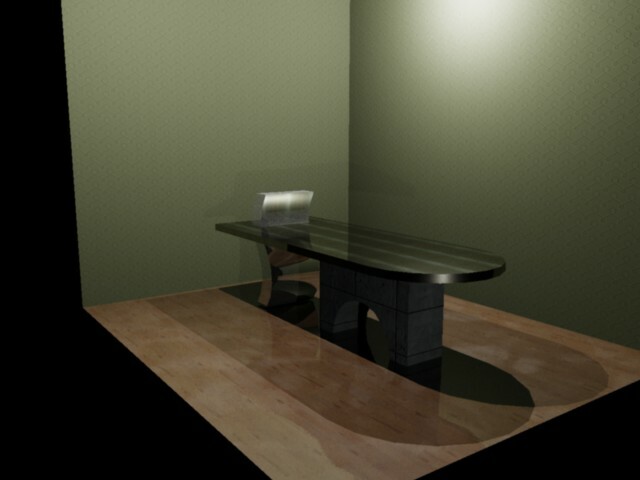 We also started working on a rough draft of a lighting and a reflected ceiling plan. In these plans we placed a variety of light fixtures and other ceiling elements like sprinklers, ceiling tiles and vents, on the plan in the areas they work best. We wrapped up the first part of phase 2 with rough finish and accessory selections. 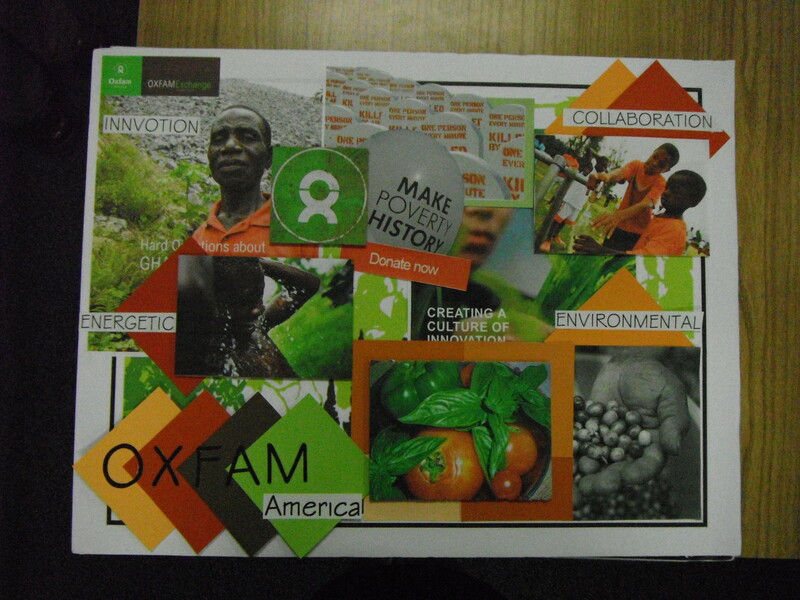 We chose a natural color palette of greens, neutrals, and oranges that matched Oxfam’s logo. We selected preliminary lamps, fabrics, carpets, hard surfaces, furniture pieces and office desk systems that we thought would work best for this specific work environment. 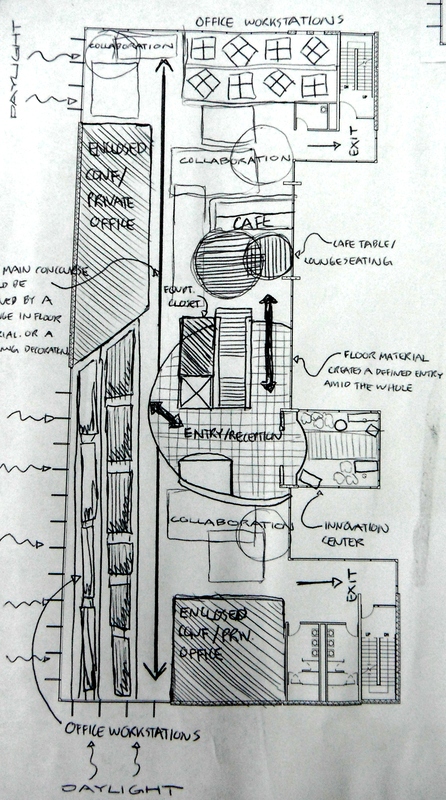 We then drew up more sketches that displayed out complete vision for the space. In the second part of phase 2 we are refining these rough draft plans to create our final plans. Final dimensioned floor plan: our final plan consisting of only walls and built in elements. We dimension all of the walls and built in structures. Finish plan: our final furniture plan that is labeled with a key indicating which finish goes on which object. 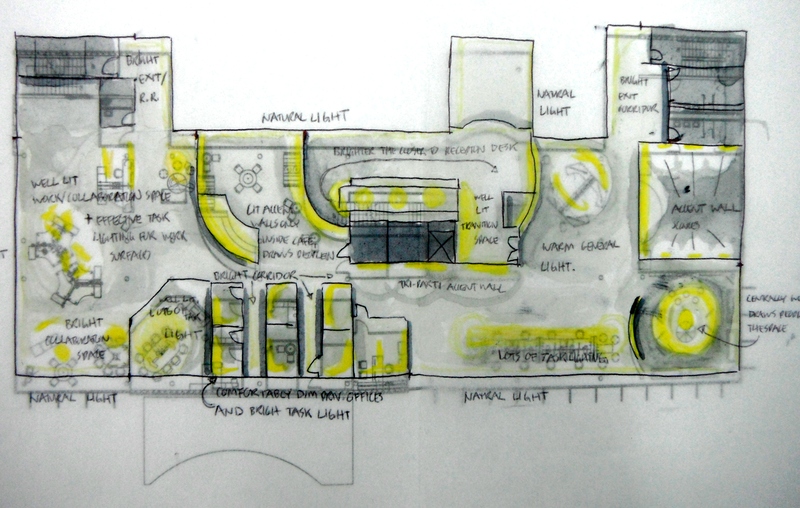 Reflected ceiling & lighting plan: our lighting layout finalized. 4 Interior elevations: we will choose 4 areas in our office to draw an elevation of to further convey what our space will look like. 2 Section cuts: this is as if we sliced the building in half vertically so that we can see the interior of the walls. Plans and axonometric drawings of 3 workspaces: these drawings are precisely measured, not a sketch, and also help to convey what the workstations will look like. Detail drawings of reception desk: we will be designing our own custom reception desk and producing drawings that show every side of the desk and the top. Detail drawings are used to show how something is to be built. Final furniture and finish selections: we must finalize the materials and furniture pieces we will be using in our office and record the information in a chart or schedule. We include keys and annotations in all of our plans so that someone looking at them for the first time would be able to navigate the page efficiently and understand the information we have provided. It can be a lot of work to complete these plans don’t get me wrong but at the same time can be very enjoyable because at this stage the plan begins to come alive and fills us all with a sense of excitement and accomplishment.